John SCAMMON (1598 – 1660 ) was Alex’s 11th Great Grandfather; one of 4,096 in this generation of the Shaw line. He was also Alex’s 12th Great Grandfather; one of 8,192 in this generation of the Miller line. John Scammons was born on 29 Jun 1598 in Nettleton, Lincolnshire, England. His parents were Richard SCAMMON Sr. and Prudence WALDREN. Alternatively, his father was Capt Edmond Scammon. He married Elizabeth TALERE (TAYLOR) on 6 Nov 1623 in Nettleton, Lincolnshire, England. He arrived in Boston about 1630. It is believed that he first came to Barbados in the West Indies and later continued onto Boston. He ultimately settled in the area of Portsmouth, New Hampshire about 1640. He died about 1660 in Dover, Strafford, N. H.
Richard and John Scammons were brothers who both immigrated to New Hampshire. Most genealogies show they were born about the same date, died in Dover, Strattford, N. H. about the same date. Most of the children listed for both have the same names and born on the same dates which makes it easy for some to assume they are are the same person. Elizabeth Tailor was born on 24 Oct 1602 in Nettleton, Lincolnshire, England. Elizabeth died in 1680 in Kittery, Maine. 1637 – John’s possible father Captain Edmund Scammon commanded a British war vessel under Admiral Rainsborough. 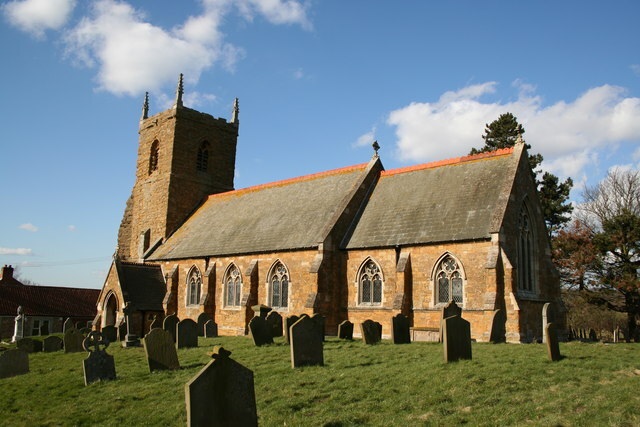 Several families of the Scammon name are now landed proprietors in Lincolnshire, England. Sometimes John’s nephews and nieces from his brother Richard are attributed to him. Humphrey’s wife Elizabeth was born about 1645 perhaps in Kittery, York, Maine. She may have been Elizabeth Harvey and her parents were William Harvey and Joane Hucker. If so, her grandparents were Thomas HARVEY and Joan COLLIER. Elizabeth may have died in 1746 in Kittery York, Maine, but I haven’t seen any record of her being a centenarian. Humphrey was the first Scammon born in America. He lived in Kittery, Maine until 1679 when he moved to Saco, Maine, two and a half miles inland from the coast along the Saco River. He purchased 200 acres of land from the widow of Henry Waddock located along the Saco River a half mile from its mouth. At this location he operated a ferry and an inn, described at the time as a “publique house of intertaynment”, near Biddeford Pool. Humphrey was first seen in America in Oct 1667 when widow Sarah Abbott withdrew a suit against him for refusing to satisfy her for lodging, etc., and for fish lent him in her husband’s lifetime. His was a most important ferry for which his predecessor had been ordered to provide a good, sufficient boat, large enough to carry over three horses at one time. Scammon received “nine pence for the ferrage of a horse and man”. Early ferrage charges were 2d cash and 3d on account for each person. Humphrey had also been “allowed to keepe a publique house of Intertaynmt” from 1680 until 1686 and was in charge of taking the tax lists to York in 1682. He was also in charge of seeing the minister’s cellar dug and stoned in 1686 and was a deputy in the same year. He had a sawmill at Blackman’s Falls on the Dunstan River and was a culler of fish in 1695/96. In 1699 he was on the grand jury. He was chosen Cape Porpoise constable Feb 1678/79; of Cape Porpoise, bought the Henry Waddock farm in Saco, ME on 4 Dec 1679 and there was given town privilege and a ferry license in June 1680, followed by a tavern license from 1680-1686; townsman & comr. to take the lists to York 1682; j. 1684; gr. j. 1685; goodman S. & Edw. Sargent to collect the minister’s salary in 1685; he to see the minister’s cellar dug and stoned in 1686. Deputy 1686. He returned to Kittery in wartime, and bought Mrs. J. Bray’s estate in 1694; returned to Saco to be taken captive with wife and sons Humphrey & Samuel in 1703. One Humphrey was a resident of Truro, Mass. when that town was incorporated. In 1697, Humphrey, his wife and sons Humphrey and Samuel were taken captive. The story of the capture is based upon the tale of Samuel’s granddaughter. While Humphrey [age 57] and Humprehy Jr.[age 20] were working at work on piece of marsh in neighborhood of lower ferry, a short distance from the house, Indians attacked the family residence. She led them to the ferry and the whole family was immediately marched away into captivity. The family was led through heavily wooded country to the Sokoki Indian capital, Peckwodgett, now known as Fryeburg, Maine. When they arrived, the war council were of a mind to kill the captives, but the chief remembering the promise spared the lives of their prisoners. Nevertheless, the captives were subjected to “great cruelty”. At the Black Point garrison in August “a captive” was sent by the Indians with a flag of truce to the garrison. They sent “Elizabeth Scammon… but the officer well knowing their intreague slighted the message, secured the captive and suffered no messenger approach any nearer than what the muzzles of his guns have license for”. Elizabeth was rescued. When the Scammon family returned from their captivity in Canada following a peace treaty, they found their home exactly as they had left it. The family cat was still there awaiting their arrival, having lived at the home during their absence. The mug Samuel had been carrying to his father was still where he had left it. That mug is still in existence, having been preserved as a tribute to the fortitude of those pioneers. 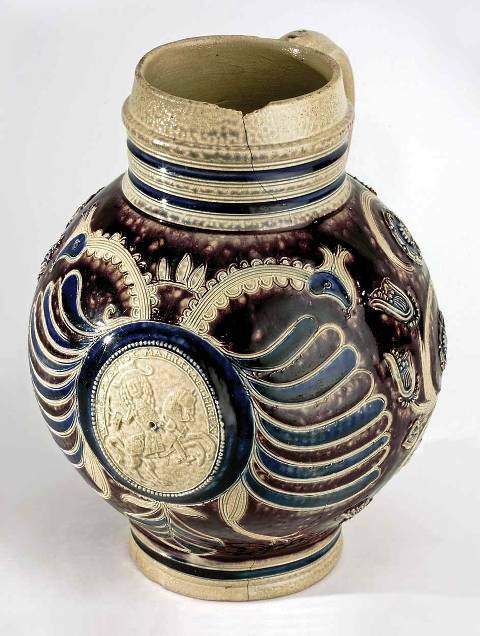 It is a handsome piece of brownware with the likeness of Prince William of Orange who married Mary, the daughter of James II and was called to the throne of England in 1689. Prior to that he had enjoyed great popularity in Holland as a result of his victories over the French. It is believed that the mug was made in celebration of those victories. The mug is now in the collection of the Dyer-York Library and Museum in Saco, Maine and it was featured in the 1982 copy of Smithsonian Magazine. The mug is salt-glazed stoneware and was made in the Westerwald district of Germany 1689-1702 and bears the likeness of King William III. The attack on the Scammon home was also witnessed by a boy named Robinson, who immediately went to the nearby garrison to give warning. He could see that any resistance would be futile. He made his escape by horseback to the Saco River at Grey’s Point and swam from there to Cow Island, and then to the opposite shore. At the garrison, he found only women and a few old men. At his suggestion they all put on men’s clothing and uniforms and showed themselves around the fort, giving the impression that the place was heavily guarded. The Indians dared not attack. Many members of the Indian party attested to the success of this maneuver afterward. In his will Humphrey stipulated that “1/2 acre of land at the ferry place be reserved forever as a burying place for my relations.” The exact site of Humphrey’s final resting place cannot be found, but the slate markers on the graves of his two sons are visible today. iii. Rebecca Scammon (1680 – ); m. in 1703 to John Billings, who was a son of John Billings of Kittery Maine. She was his 2nd wife. No children. This entry was posted in 13th Generation, 14th Generation, Historical Church, Immigrant - England, Line - Miller, Line - Shaw, Storied, Tavern Keeper and tagged Humphrey Scammons's Mug, Kittery, Saco. Bookmark the permalink.